HiperLAN stands for High performance LAN. While all of the previous technologies have been designed specifically for an adhoc environment, HiperLAN is derived from traditional LAN environments and can support multimedia data and asynchronous data effectively at high rates (23.5 Mbps). A LAN extension via access points can be implemented using standard features of the HiperLAN/1 specification. However, HiperLAN does not necessarily require any type of access point infrastructure for its operation. HiperLAN was started in 1992, and standards were published in 1995. It employs the 5.15GHz and 17.1 GHz frequency bands and has a data rate of 23.5 Mbps with coverage of 50m and mobility< 10 m/s. It supports a packet-oriented structure, which can be used for networks with or without a central control (BS-MS and ad-hoc). It supports 25 audio connections at 32kbps with a maximum latency of 10 ms, one video connection of 2 Mbps with 100 ms latency, and a data rate of 13.4 Mbps. HiperLAN/1 is specifically designed to support adhoc computing for multimedia systems, where there is no requirement to deploy a centralized infrastructure. It effectively supports MPEG or other state of the art real time digital audio and video standards. The HiperLAN/1 MAC is compatible with the standard MAC service interface, enabling support for existing applications to remain unchanged. HiperLAN 2 has been specifically developed to have a wired infrastructure, providing short-range wireless access to wired networks such as IP and ATM. Type 1 has a distributed MAC with QoS provisions, whereas type 2 has a centralized schedule MAC. Type 1 is based on Gaussian minimum shift keying (GMSK), whereas type 2 is based on OFDM. HiperLAN/2 automatically performs handoff to the nearest access point. The access point is basically a radio BS that covers an area of about 30 to 150 meters, depending on the environment. MANETs can also be created easily. This connection oriented approach makes support for QoS easy, which in turn depends on how the HiperLAN/2 network incorporates with the fixed network using Ethernet, ATM, or IP. The HiperLAN/2 architecture shown in the figure allows for interoperation with virtually any type of fixed network, making the technology both network and application independent. HiperLAN/2 networks can be deployed at "hot spot" areas such as airports and hotels, as an easy way of offering remote access and internet services. 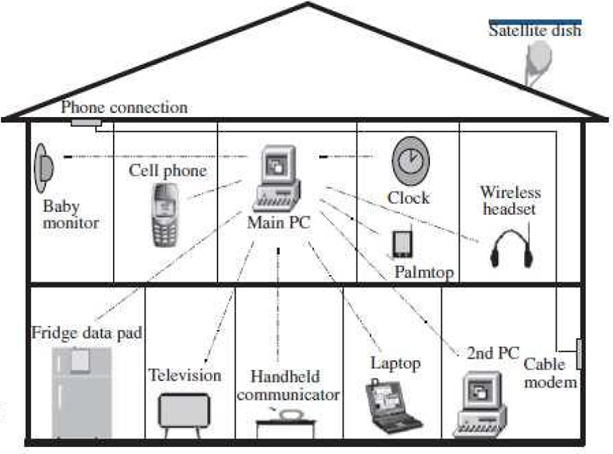 A typical home needs a network inside the house for access to a public network telephone and internet, entertainment networks (cable television, digital audio and video with the IEEE 1394), transfer and sharing of data and resources (printer, internet connection), and home control and automation. The device should be able to self-configure and maintain connectivity with the network. The devices need to be plug and play enabled so that they are available to all other clients on the network as soon as they are switched on, which requires automatic device discovery and identification in the system. Home networking technology should also be able to accommodate any and all lookup services, such as Jini. Home RF products allow you to simultaneously share a single internet connection with all of your computers - without the hassle of new wires, cables or jacks. A network consists of resource providers, which are gateways to different resources like phone lines, cable modem, satellite dish, and so on, and the devices connected to them such as cordless phone, printers and fileservers, and TV. The goal of Home RF is to integrate all of these into a single network suitable for all applications and to remove all wires and utilize RF links in the network suitable for all applications. This includes sharing PC, printer, fileserver, phone, internet connection, and so on, enabling multiplayer gaming using different PCs and consoles inside the home, and providing complete control on all devices from a single mobile controller. With Home RF, a cordless phone can connect to PSTN but also connect through a PC for enhanced services. Home RF makes an assumption that simultaneous support for both voice and data is needed. In Home RF all devices can share the same connection, for voice or data at the same time. Home RF provides the foundation for a broad range of interoperable consumer devices for wireless digital communication between PCs and consumer electronic devices anywhere in and around the home. The working group includes Compaq computer corp. Ericson enterprise network, IBM Intel corp., Motorola corp. and other. A specification for wireless communication in the home called the shared wireless access protocol (SWAP) has been developed. IEEE 802.11 is a set of standards for the wireless area network (WLAN), which was implemented in 1997 and was used in the industrial, scientific, and medical (ISM) band. IEEE 802.11 was quickly implemented throughout a wide region, but under its standards the network occasionally receives interference from devices such as cordless phones and microwave ovens. The aim of IEEE 802.11 is to provide wireless network connection for fixed, portable, and moving stations within ten to hundreds of meters with one medium access control (MAC) and several physical layer specifications. This was later called 802.11a. The major protocols include IEEE 802.11n; their most significant differences lie in the specification of the PHY layer. Bluetooth is one of the major wireless technologies developed to achieve WPAN (wireless personal area network). It is used to connect devices of different functions such as telephones, computers (laptop or desktop), notebooks, cameras, printers, and so on. Bluetooth devices can interact with other Bluetooth devices in several ways in the figure. In the simplest scheme, one of the devices acts as the master and (up to) seven other slaves. 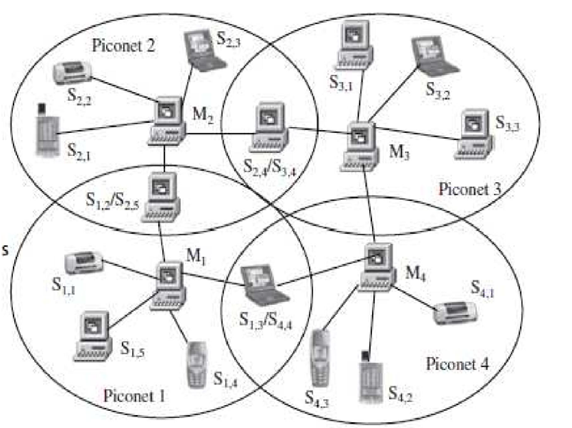 A network with a master and one or more slaves associated with it is known as a piconet. A single channel (and bandwidth) is shared among all devices in the piconet. Each of the active slaves has an assigned 3-bit active member address. many other slaves can remain synchronized to the master though remaining inactive slaves, referred to as parked nodes. The master regulates channel access for all active nodes and parked nodes. Of two piconets are close to each other, they have overlapping coverage areas. This scenario, in which nodes of two piconets intermingle, is called a scatternet. Slaves in one piconet can participate in another piconet as either a master or slave through time division multiplexing. In a scatternet, the two (or more) piconets are not synchronized in either time or frequency. Each of the piconets operates in its own frequency hopping channel, and any devices in multiple piconets participate at the appropriate time via time division multiplexing. The Bluetooth baseband technology supports two link types. Synchronous connection oriented (SCO) types, used primarily for voice, and asynchronous connectionless (ACL) type, essentially for packet data.